Arastoo: I'm sorry. I know you want to keep this a secret. Cam: Oh, Arastoo, I don't want to keep this a secret at all. Bones: I know exactly why I love you. Booth: Okay, why don't you give me your top three reasons. Bones: First, you love me. Second, you love Christine. Third, you..
Bones: No, let me gather my thoughts. Booth: That's exactly why we have music and poetry, Bones. Bones: Third, your physicality is remarkable. Now you give three of your top reasons for loving me. Booth: I don't have reasons. Bones: I think what you just said is very romantic. Booth: You made one big mistake. Suspect: Yeah, what was that? Booth: You pissed off my partner here. Angela: It was the coolest trick ever. Hodgins: It was no trick. It's a simple matter of chemistry and physics. [to suspect] She's gonna find something. She always does. Permalink: She's gonna find something. She always does. Hodgins: We have an hour before we have to let the sitter go. Have another glass. Angela: You're right. We work hard at a revolting job. And it's really pretty up here. Cam: He obviously had something to hide. 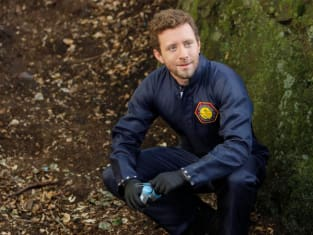 Hodgins: Well, nothing special about that. People always have something to hid. Bones: Sweets has trust issues involving finding a home. Since he grew up an orphan, the anger he's sublimated has paralyzed him from developing a healthy perspective on what having a home means. That made him bond with us and our home so he didn't have to deal with his own emotional insecurities. Booth: Bones shoots from the outside! Three points! Sweets: Where's that psychobabble coming from? Booth: Well, you left one of your psychobabble books in our bathroom.